Precision elastomer insert couplings offer technical advantages in a wide variety of power transmission applications. With the rigid jaw hubs machined from solid round bar stock, the torque density can be superior to that of almost any other type of backlash free flexible coupling, depending on the stiffness of the elastomer insert which is used. Most often, precision elastomer inserts are made from injection molded polyurethane, available in a variety of Shore hardness values, depending on the application requirements for vibration damping, flexibility and torsional stiffness. Softer materials, which are generally more suitable for damping and flexibility, also tend to be less thermally stable, meaning that as temperatures increase they soften, reducing the torque capacity of the coupling. This has historically left equipment designers to make compromises around high heat, either significantly upsizing the elastomer coupling, or changing to torsionally rigid metallic couplings, which are suitable for a subset of dynamic drive applications but lack the ability to absorb vibration and shock. To address this problem and more, the R+W coupling development team is now able to offer elastic coupling inserts from stainless steel mesh – mostly eliminating the temperature factors needed when sizing precision elastomer couplings, facilitating compact solutions even in the presence of high heat. Formed out of AISI 316L hard drawn wire, these new elastic inserts are corrosion resistant, providing further advantages. They generally function in a temperature range from -30° to 500° C, with some special applications having run all the way up to 600° C. This makes them a great choice for oven conveyors and other heating systems, small hot work rolls, down hole oilfield equipment and much more. In fact, R+W uses them in their own hydraulic test benches to avoid the problem of hot oil making the traditional plastic materials brittle. Capacities range from 2 Nm to a maximum acceleration torque of 1350 Nm, and a maximum bore diameter of 60mm. Larger sizes are also an option for custom projects, as this insert type can scale up and change dimensions in a variety of ways, as a matter of the tooling. Stiffness values can also be adjusted by changing the density to which the wire is compacted in the forming tool, allowing the couplings to suit a variety of performance requirements. 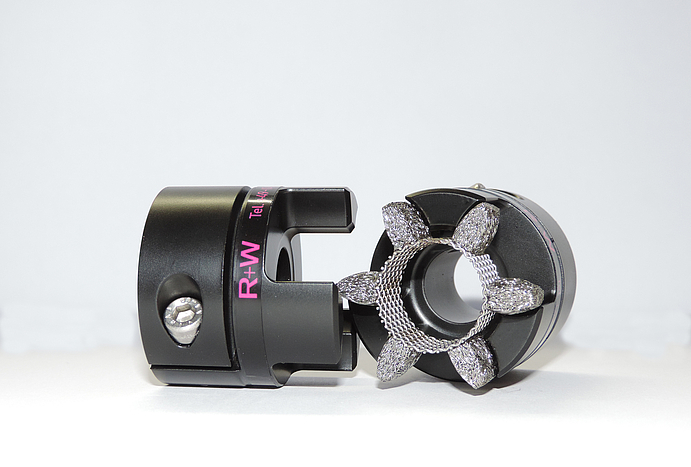 For designers who have had to compromise by using larger couplings than otherwise necessary, or coupling styles that are less desirable, the new elastic metal insert couplings from R+W could be just the solution. Contact your R+W representative for consultation on your specific requirements.